Can buildings make you smile? 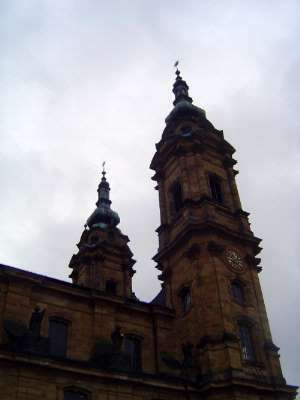 It's a question prompted by three Baroque buildings: the Schloss Bruchsal, the St. Paullin church in Trier, and the--hold your breath--Vierzehnheiligen pilgrimage church. 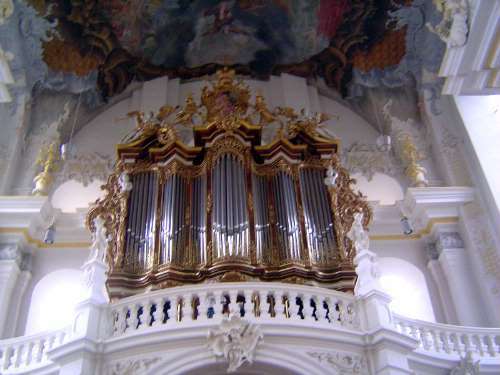 Critical parts of each were designed by Johann Balthasar Neumann (1687-1753), a near-exact contemporary of Johann Sebastian Bach. 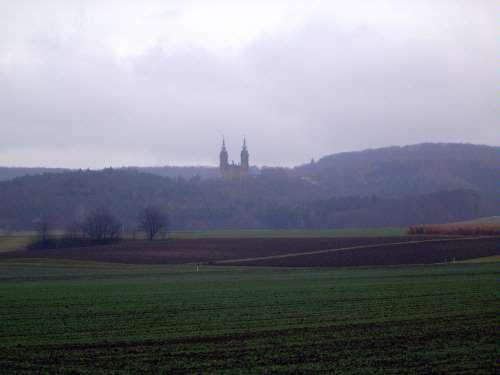 How could Germany during its postwar economic miracle have produced landscapes like this? It's better than rubble, but the Germans themselves knew that buildings should do more than keep you warm and dry. 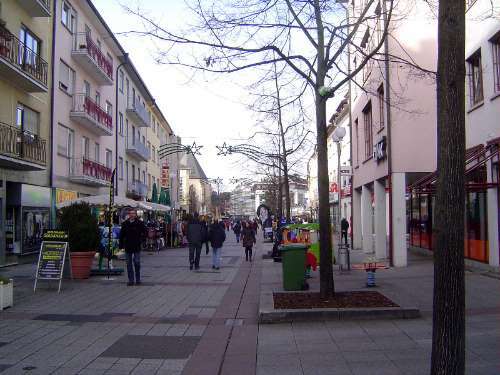 Walter Scheel, West Germany's president in 1975, put it this way: "Our cities and villages are in danger of becoming faceless and without history. They threaten to become inorganic, uglier, and more impersonal." (Quoted in Joshua Hagen, Preservation, Tourism and Nationalism: The Jewel of the German Past, 2006, p. 269). See that church in the left background? Maybe it offers some hope. Oops! That was a mistake. We can do better a few blocks away. 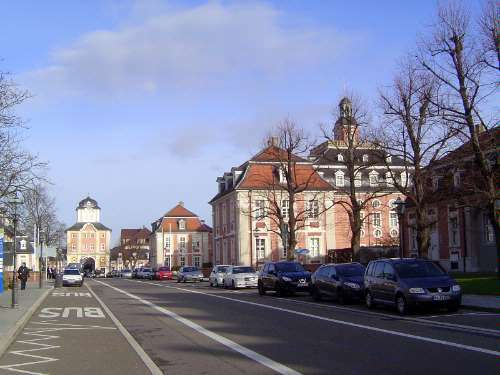 We're in Bruchsal, by the way, where the bishop of Speyer moved his palace after the French army burned his old palace--and because the mostly Protestant population of Speyer wasn't much friendlier. Not your typical classical sculpture. Instead, an abstract overflowing of forms. 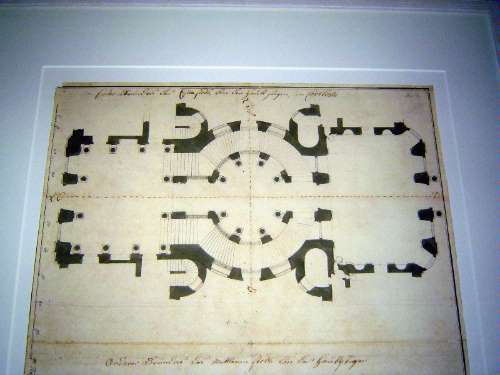 Pevsner continues: "The palace... was in quite an advanced state when in 1730 Neumann was called in to redesign the staircase" which wound up filling "an oval room, larger than any other in the palace." Here's the base. 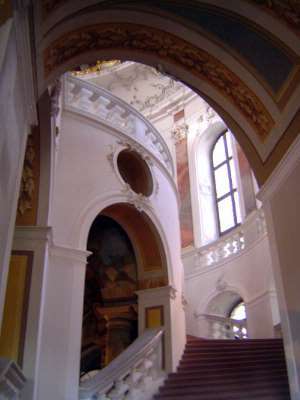 Pevsner: "In the Middle Ages staircases had mattered little. They were nearly always tucked away--a purely utilitarian part of the buildling...." Not here, where we're after "spatial rapture." 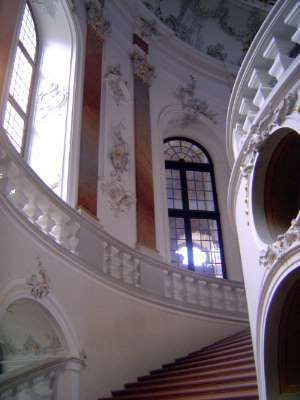 The two arms of the stairs rise under a dome and meet at the top in an island under the dome. 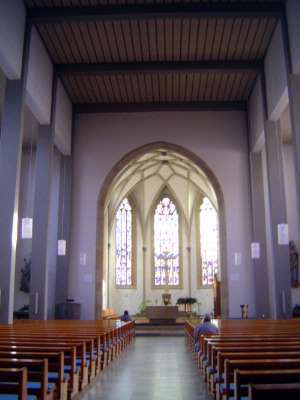 Pevsner: "Words can hardly re-evoke the enchanting sensation experienced by anybody who has had the good fortune to walk up one of its arms, when it still existed undamaged by war.... And while you walked up, it grew lighter and lighter around you, until you reached the main floor and a platform the size of the oval room beneath. 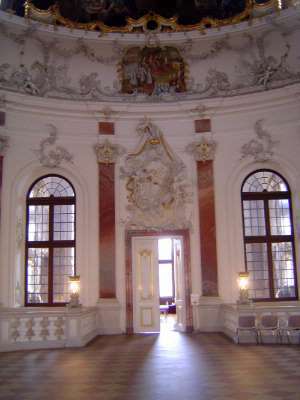 But the vault above covered the larger oval formed by the outer walls of the staircase." He's right, though of course the staircase here is the postwar reconstruction. An odd angle emphasizing the surprise near the top. 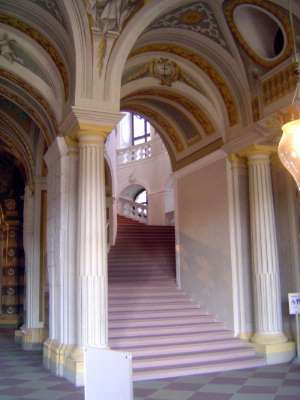 The platform atop the staircase leads into rooms on either side. Keep an eye on the plasterwork over the door. 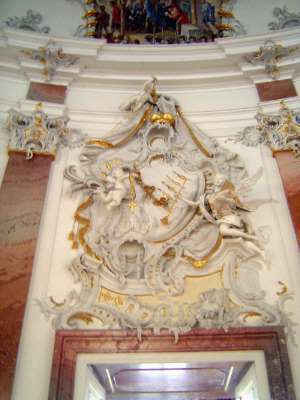 Pevsner says that the cartouche was by a Bavarian stuccoist, Johann Michael Feichtmayr. "Not one part is symmetrical. 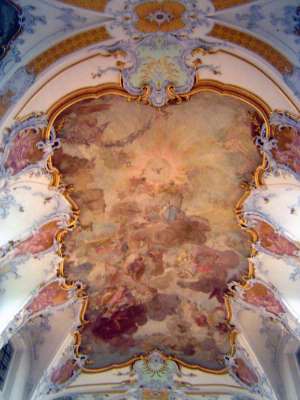 The main composition is a zigzag, from the alluring young angel on the right, up to the cupid and cherub higher up on the left, and up again to the cherub at the top. The forms in detail seem to be incessantly changing, splashing up and sinking back. What are they? Do they represent anything? Sometimes they look like shells, sometimes like froth, sometimes like gristle, sometimes like flames. This kind of ornament is called rocaille in France, where it was invented in the 1720s by Meissonier, Oppenord, and a few others of provincial or semi-Italian background. 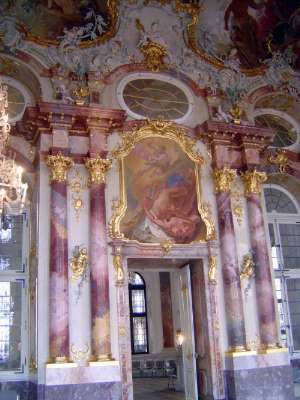 It has given the Rococo style its name, and rightly so; for it is a completely original creation, not dependent on anything of the past, as the ornament of the Renaissance had been. It is abstract art of as high an expressional value as any that we are offered today so much more pretentiously" (p. 150-1). 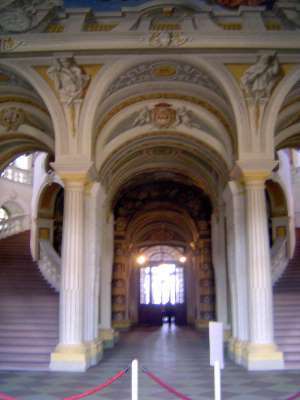 Looking back toward the platform and its balustrade. 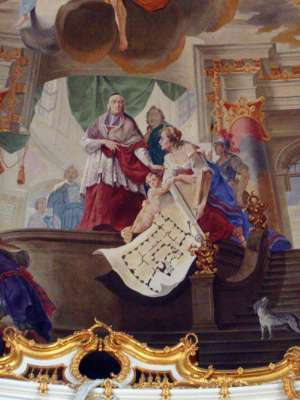 A painting high in the same room shows a proud Damian Hugo von Schöborn, Bishop of Speyer, posing with the plans. 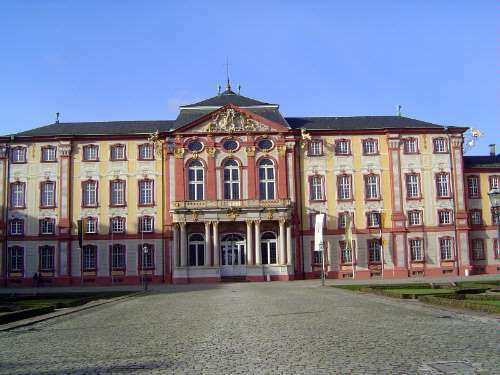 It was he who hired the first architect, von Welsch; the second, von Ritter zu Grünstein; and the third, Neumann. Another diagram of the Hauptbau. 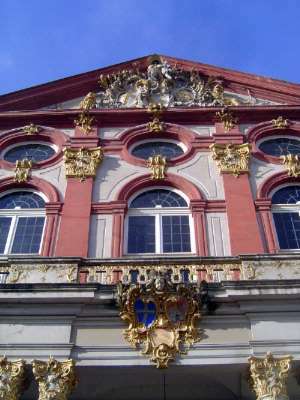 Pevsner writes: "Bruchsal with its perfect unity of space and decoration was the high-water mark of the Baroque style. It was also its end. 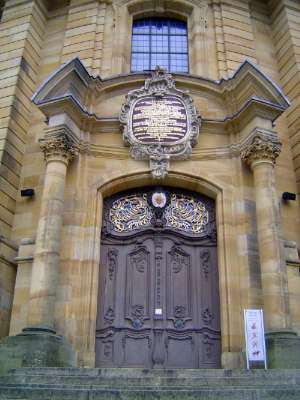 For only a few years after it had been completed and Neumann had died, Winckelmann published his first books, initiating the Classical Revival in Germany." 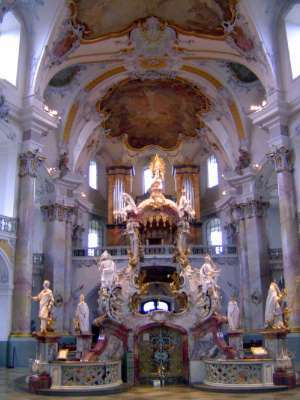 But not before Neumann had a hand inside the Saint Paullin Church in Trier. Again, the French army gets the credit or blame for having burned down an earlier church. 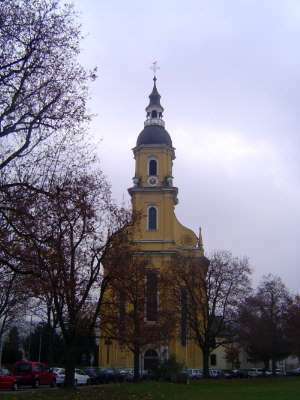 This one was built in 1734-53 to a design by an unknown architect, possibly Christian Kretzschmar. 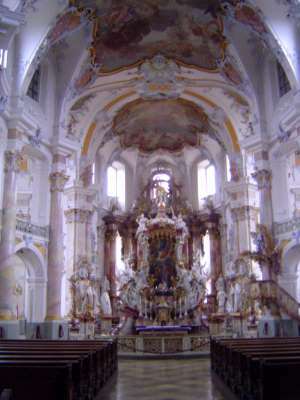 The interior is the work chiefly of Neumann. 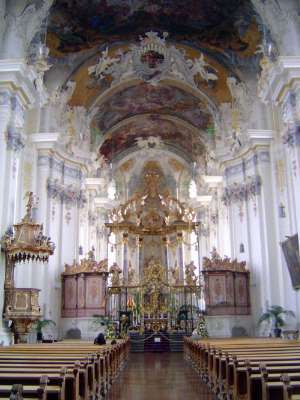 There is a political aspect to its exuberance, with the Catholic church celebrating its triumph over the Reformation, but there is also a more direct interpretation, with the Church creating a worthy successor to Gothic transcendance and putting in its place a spot on earth for divine love. 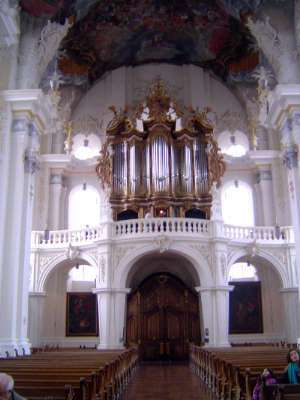 The instrument was restored in 1991 but has been here since the beginning. 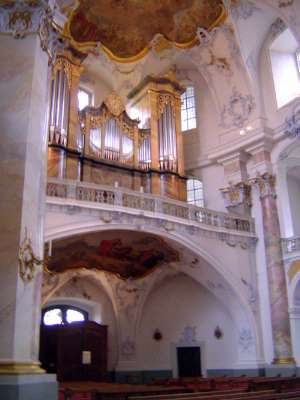 Pevsner makes much of the analogy between the form of Neumann's buildings and the form of Bach's fugues. 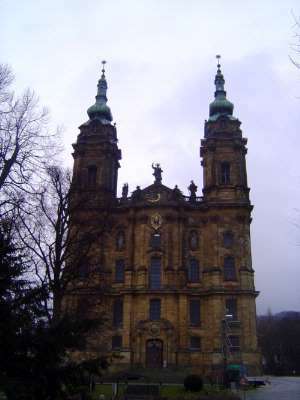 And so to Vierzehnheiligen, built 1743-72 on the supposed site where a shepherd saw a vision of the Christ Child surrounded by 14 saints appearing as children. Hence the name: 14 Helpers or Saints. It's hard to believe on this gloomy day, but David Watkin is correct in writing that inside we will find "a radiant expression of divine gaiety" (A History of Western Architecture, 3rd ed., p. 330). The door's locked, but come around to the side. Then wow! We're looking at the focal point of the church, the altar of the 14 Helpers. Watkin calls it "...as fantastic as Cinderella's coach," though that does seem to cheapen it. 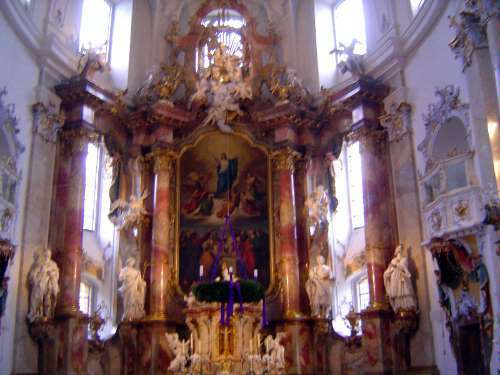 Oddly, this is not the main altar of the church and stands, instead, in the nave and at the point of the shepherd's supposed vision. 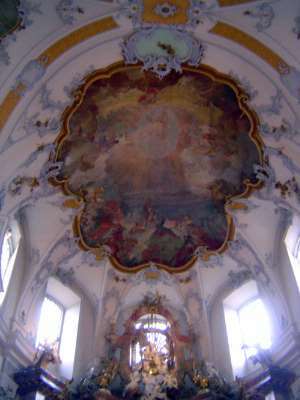 (We're standing in the nave, and the altar stands between us and the crossing, marked by the blue sky in the ceiling.) Pevsner's enthusiasm knows almost no limits: "What exaltation in these rocking curves, and yet what grace! It is joyful but never vulgar; vigorous, boisterous perhaps, but never crude. It is of an inexhaustible creative power, with ever new combinations and variations of Italian Baroque forms placed against each other and piled above each other. The forward and backward motion never stops." 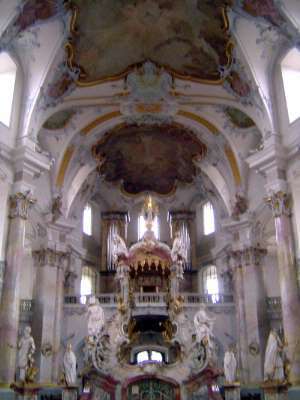 The main altar is comparatively anticlimactic, but notice the shape of the curve, which is oval instead of circular. 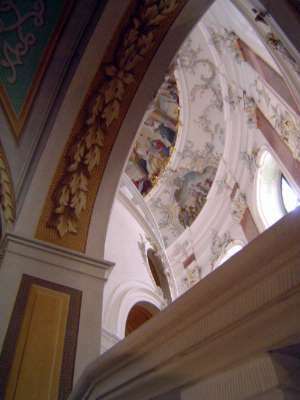 The oval is in three dimensions, not two; here it is embodied in the dome over the choir. Pevsner writes: "There were heretics and there were skeptics. To restore the first to the fold, to convince the others, religious architecture had both to inflame and to mesmerize....[in] an atmosphere to concentrate the thoughts of a congregation on worship and prayer." How to do that most spectacularly? Pevsner: "Neumann's work proves conclusively what architectural purity and subtlety can be achieved by such spatial magic, provided the visitor to his buildings is able to follow his guidance... The first impression on entering this vast, solitary pilgrimage church is one of bliss and elevation. All is light: white, gold, pink..."
Notice that the columns are not in a straight line. 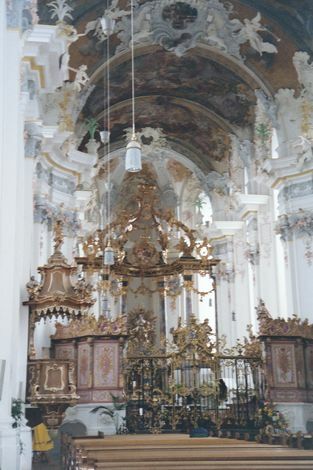 Pevsner: "The oval central altar in the middle of the nave may well please the rustic worshippers who kneel round this gorgeous object, half a coral reef and half a fairy sedan chair. Having taken in this glory of confectionery, the laymen will then look up and see on all sides glittering decoration, surf and froth and rocket, and like it immensely." Still, Pevsner insists, "It is not enough to be overwhelmed by it... it asks for an exact understanding--which is a job for the expert: architects' architecture, as the fugue is musician's music." He has in mind, at least in part, the complex curvature of the ceiling. 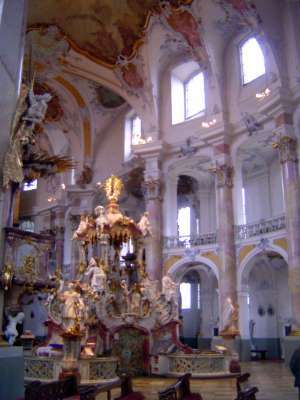 Unlike the arches at Trier's St. Paullin church, the arches here "are not simple bands across from one arcade column to the one opposite. They are three-dimensional, bowing to each other." Pevsner continues: "This has the most exciting and baffling effect at the crossing. 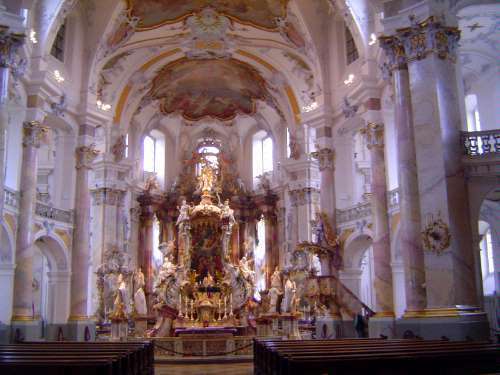 Here in a church of the Gesú type--and Vierzehnheiligen appears from outside to belong to the type--one would expect a dome, the summit of the composition. Instead of that, there lies, as has been said before, just at the centre of the crossing, the point where choir oval and central oval meet. 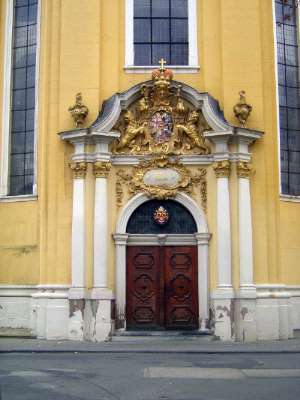 The two transverse arches struck from the piers of the crossing bend, the western one eastward, the eastern westward, until they touch each other in exactly the same place as the ovals, purposely emphasizing the fact that, where a normal Baroque church would have had the crest of the undulating movement of the vaults, Vierzehnheiligen has a trough, a most effective spatial counterpoint."